Coming back from Rob Roy Valley and South Rivendell, we passed Wanaka once more and then continued heading south towards Queenstown. There are three roads you can take, and each road contains different filming locations. So we were a bit at odds, but eventually we drew a route that would take us through the wonderful Cardrona Valley up a mountain which grants an expansive view over many different landscape features used in the movies, and then a bit back to the Pillars of the Kings, before continuing to Queenstown. We left out Arwen's flight to Rivendell for now. 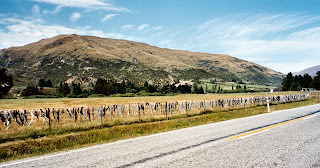 The Cardrona Bra Fence was a controversial tourist attraction in Central Otago, New Zealand, where passers-by started to add bras to a rural fence, with the fence eventually growing into a famous tourists attraction with hundreds of individual bras. 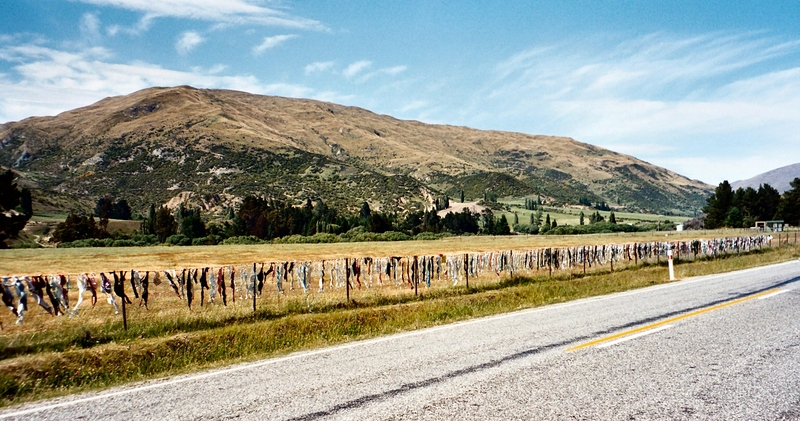 The fence was on a public road reserve adjacent to farm property in the Cardrona Valley area southwest of Wanaka. The bras are gone now, but the fence can still be seen. And from time to time passer-bys still leave some underwear when crossing the valley. Another attraction is said view of landscape features used for the filming. You can see the river Anduin flowing towards the Pillars of the Argonath and Dimrill Dale high in the hills. Furthermore you can get a glimpse of the Ford of Bruinen and Amon Hen. Finally on the way through Cardrona Valley you pass an old hotel called Cardrona Hotel, which not only hosted the filming crew but has also some striking resemblance with the Prancing Pony at Bree.